Should states impose tougher restrictions? More teenage drivers are involved in car crashes every year — and more are killed — than any other age group. And the number of deaths is rising, even though overall fatalities of teen drivers and passengers have decreased substantially in the last 25 years. 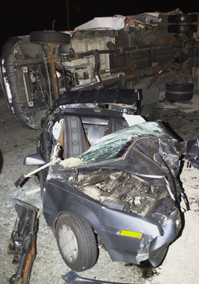 Still, some 6,000 teens die in accidents annually — more than 15 a day. Teens are the least likely age group to use seat belts and the most likely to drink and drive. Moreover, the presence of teenage passengers strongly increases the risk that a teen driver will crash, as does driving at night or on weekends. Graduated driver licensing programs have helped bring down teen crash statistics in many states, but safety experts and advocates say more needs to be done, including imposing tougher limits on teen driving. Some say driver education programs are ineffective; others argue that state laws need to be better enforced. Almost all agree, however, that parents need to be more involved in training and monitoring teenagers behind the wheel.